As the realization dawned on me that the bus I would be sitting on for 3+ hours had no air conditioning and was equipped with windows that didn't open, I was pretty sure I was going to be miserable. This fact was compounded by 90+ degree heat, a packed bus, and a chain-smoking driver who kept dozing off behind the wheel as we zoomed along on twisty, narrow mountain roads up in the Bulgarian mountains. Did I say miserable? Perhaps “fearful for my life and sanity” is more like it. Yes, it's true that the ride from Sofia to Rila Monastery was less than pleasant. In fact, it probably ranks up there as one of the worst bus rides of my life. 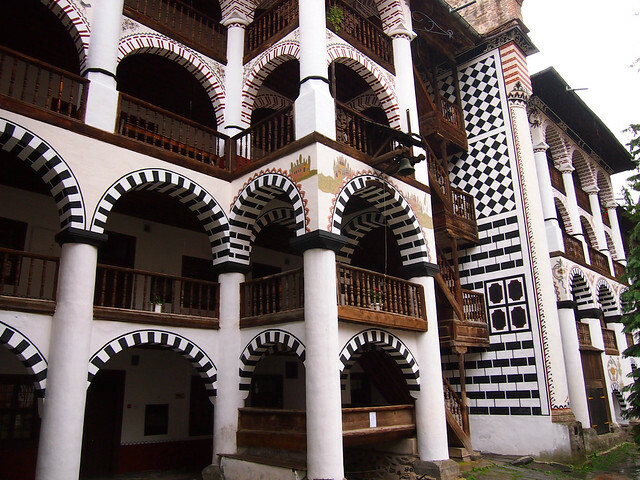 It was in college that I first heard of Rila Monastery. ,” which weaves real history together with a modern-day vampire tale. That book was about 99 percent responsible for my desire to go to Eastern Europe in the first place. Even before I had made concrete plans for my summer trip to Europe, I knew that Bulgaria was going to be included, just so I could visit Rila. 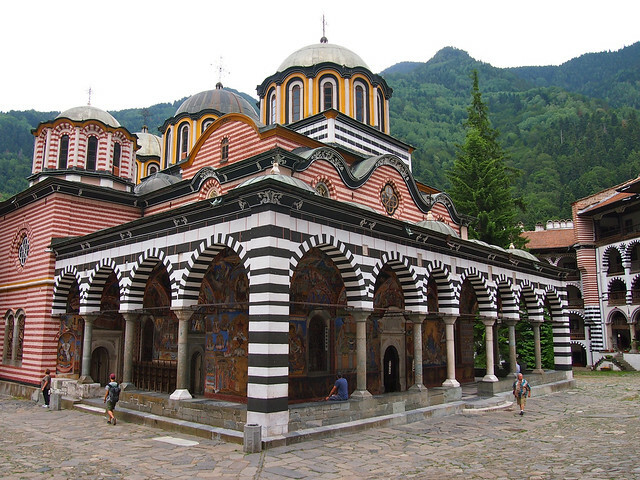 The monastery (which is officially called the Monastery of Saint Ivan of Rila) is the largest and most well-known Eastern Orthodox monastery in Bulgaria. Pilgrims and tourists come from all over the world to visit its painted church, arch-laden residential buildings, and museum. The surrounding mountain scenery is an added bonus. The current monastery complex isn't actually all that old by European standards, but its namesake, the hermit Saint Ivan of Rila, lived in a nearby cave in the mountains in the 900s AD. The early monastic buildings were destroyed in a fire in 1833, and reconstructed over the next 30 years. Today, the site is designated as a UNESCO World Heritage Site. As soon as we arrived (and kissed the ground after that harrowing bus ride), I could immediately understand why this spot has been recognized by UNESCO. And what cultural identity there is! 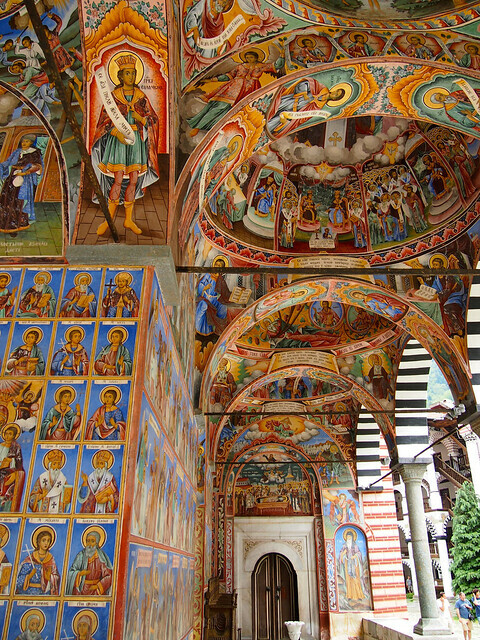 The highlights of visiting Rila Monastery definitely are the courtyard and the Church of Rozhdestvo Bogorodichno with its yellow domes and exterior frescoes. As you can see in my photos, when I say “exterior frescoes,” I mean exterior frescoes! 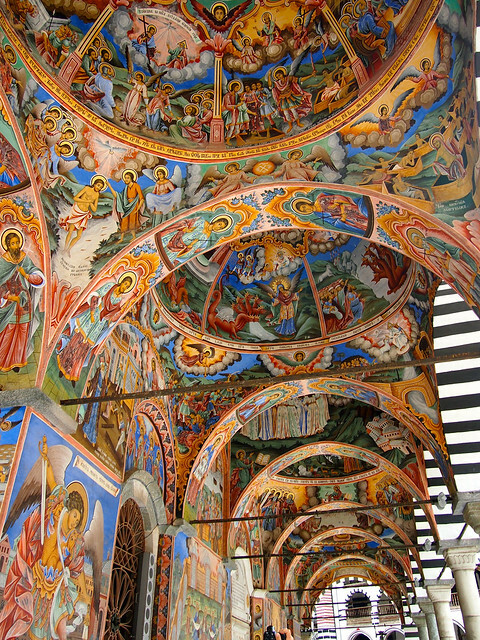 The outside of the church is covered in striking, saturated frescoes. 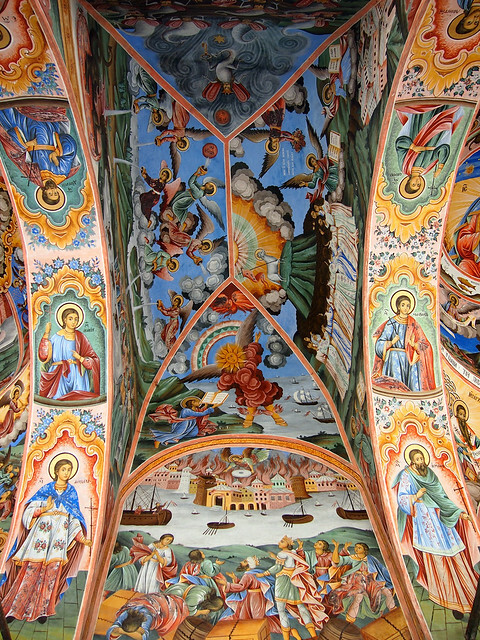 They were painted in the mid-1800s by a handful of Bulgarian artists, with the most famous being the Zograf brothers. At first glance they look cheery, but you can find some pretty disturbing images, too, if you look closely. These are contrasted by the serene, relaxed atmosphere that envelops the whole place. This is, after all, still a working monastery along with being a tourist attraction. 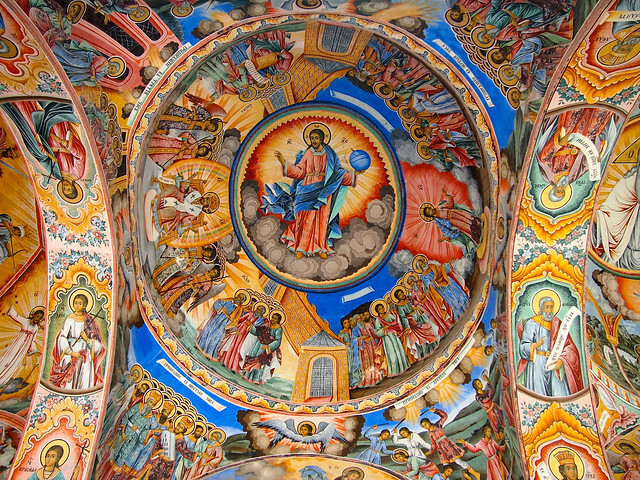 Along with touring the main church at Rila, you can also visit the Ecclesiastical & Historical Museum and the Icon Gallery, and grab lunch at the Restaurant Drushlyavitsa (just outside Rila Monastery's Samokov gate) or Rila Restaurant (part of the Tsarev Vrah hotel). If you're staying overnight, there's also excellent hiking in the surrounding Rila Mountains. 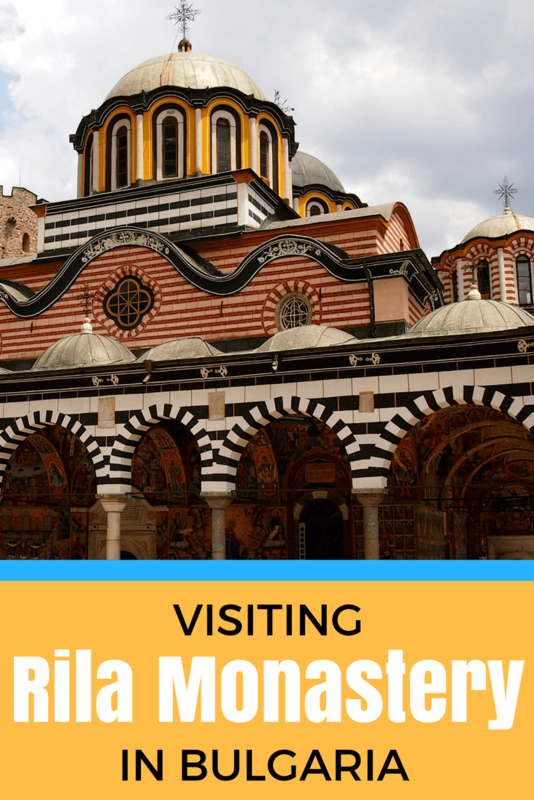 Getting there – If you don't have a car yourself and don't want to take a guided trip, the easiest (but not most pleasant) way to reach Rila Monastery is by public bus from Sofia. 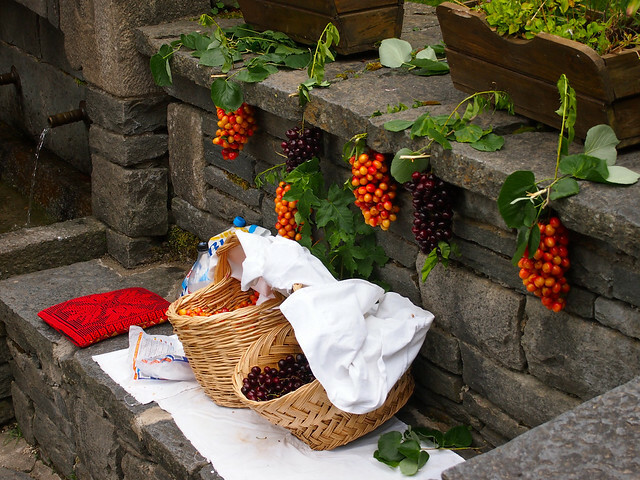 The ride takes roughly 3 hours one-way, with one bus transfer in the village of Rila. The tricky part is, there's only one bus per day from Sofia (leaving around 10:20 a.m.), and only one bus back (around 3 p.m.). 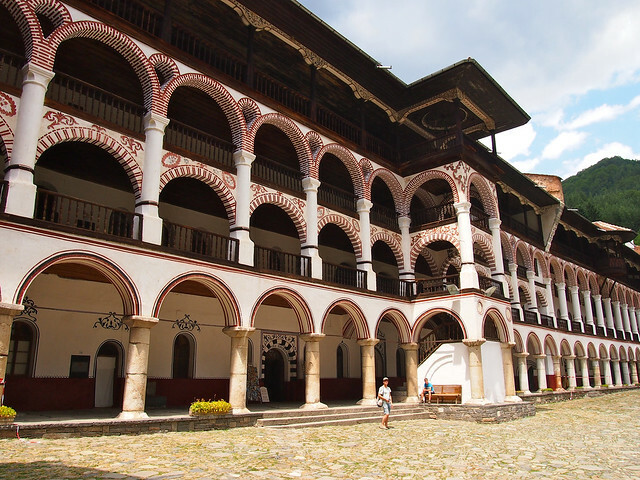 Pricing – Entry to Rila Monastery is free! The museum, however, requires a small entry fee. And donations, of course, are also accepted. What to wear – Rila is still a functioning monastery, so modesty should be observed out of respect for the monks who call the place home. No mini skirts or short-shorts are permitted, and both men and women should cover their shoulders when entering the church. If you're deemed to be too exposed to enter the church, there are some cover-ups available for you to use. Taking photos – You can take all the photos you want in the courtyard and of the frescoes on the outside of the church. Photos are NOT permitted, however, inside the church, the residential parts of the monastery, or the museum. Where to stay – If you don't want to cram everything into one day, there are very basic, hostel-style rooms available to rent at the monastery. There's also the Hotel Tsarev Vrah just outside the monastery gates, which also offers very simple rooms. You can also look for hotels in Rila. 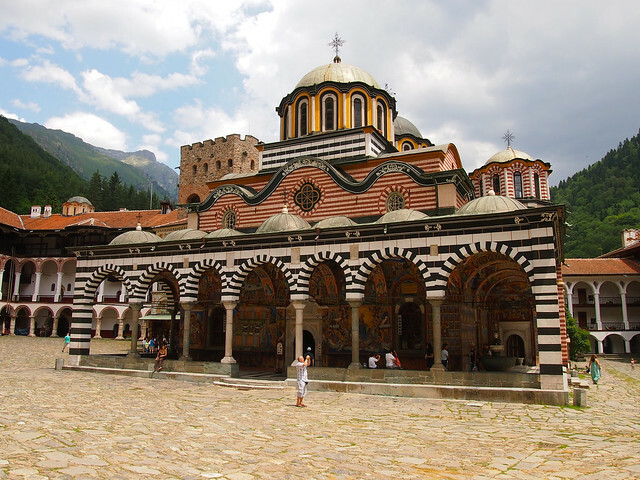 Just like the rest of Bulgaria, Rila Monastery isn't a place many people outside of Eastern Europe visit (yet). But I promise it's a site well worth the effort! 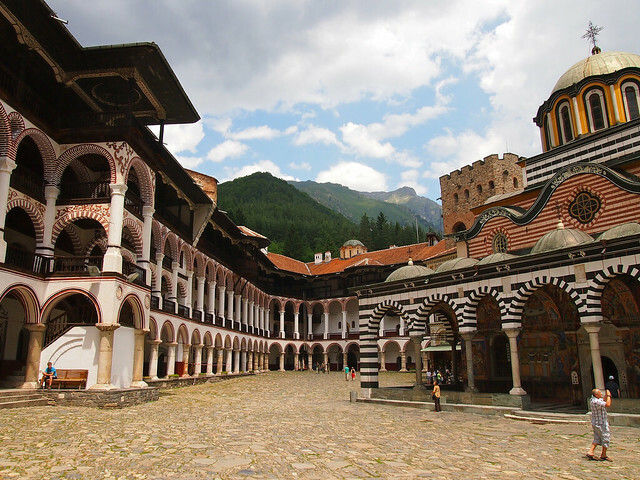 Would YOU want to visit Rila Monastery? 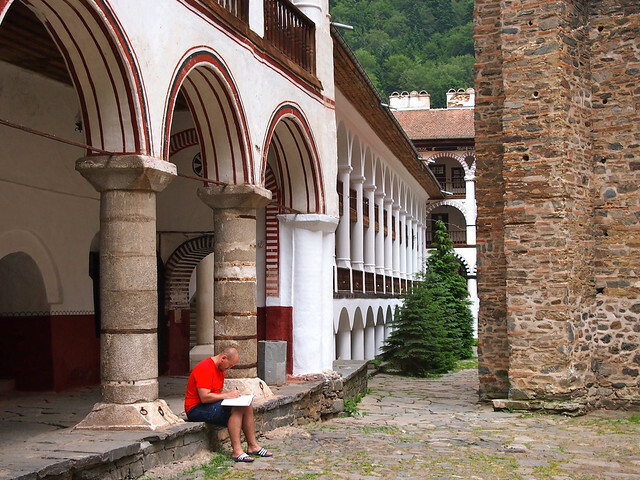 *Note: I visited Rila Monastery as part of a complimentary 18-day “Eastern Europe Explorer” tour with Intrepid Travel. But all opinions, as always, are entirely my own. I’m dying to go to Eastern Europe and The Historian is almost 100% responsible for that! For now, I’ll live vicariously through you and your awesome pics. Ooo, another Historian fan, yay! 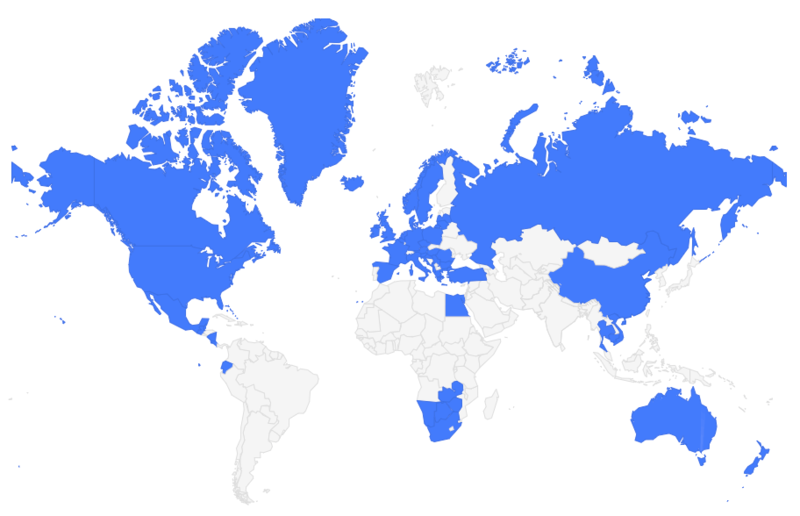 I visited almost every place mentioned in that book this summer. And it was awesome. Beautiful beautiful artwork. Nicely photographed and described, Amanda! Thanks, Henry! I really, really loved this place! Those colors are So brilliant. Your Eastern Europe journey has me intrigued. I knew the church was going to be colorful, but I didn’t realize just HOW colorful it would be! If you’re considering a trip to Eastern Europe, I highly, highly recommend it! Maybe after the ITB Berlin. Great photos. I’m a photo junkie, so that’s important to me. After seeing your photos I think it’s high time I changed my old digital camera to something more professional for blogging. What camera do you use? 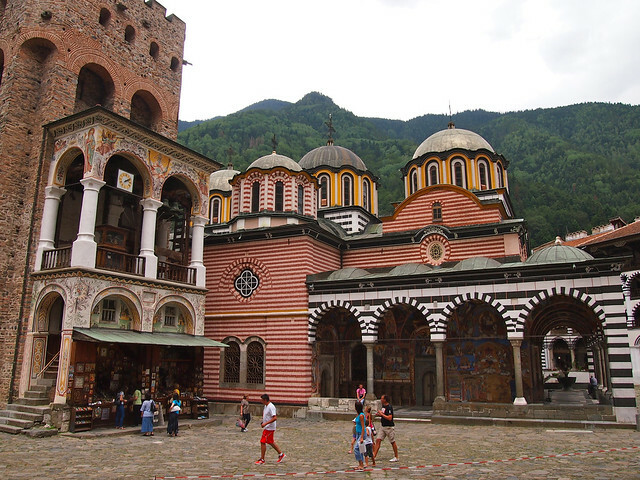 the Church language in Bulgaria would be the spoken language of the country. Thanks for those fun facts, Ele! I’m glad you liked the photos. Right now I’m shooting with an Olympus E-PM1, and love it. Amazing photos. Not sure my travels will get me to Bulgaria one day, but this is definitely a gorgeous place! Awesome to hear!! I love introducing people to new places/sights! Wow it’s just so beautiful!!!! Great shots! Thanks, Andi! It’s a true example of amazing Orthodox construction! What a wonderful place! But I think we’ll rent a car 🙂 You are the hero! Haha, I would definitely suggest renting a car, or bargaining with a cab driver. That bus was the worst! This place is stunning! I’ve never heard of it before but it’s going on the list now. That place is so incredibly beautiful; some of the photos in this article would have been worthy candidates for your photo-of-the-week feature. I can’t imagine how long it took to paint those frescoes . . . And I also really like all the arches. But yes, the frescoes and arches are all very pretty – and very photogenic! Wow, A! What a beautiful place. Adding this to my list if I ever get to Bulgaria. Definitely add it to that list! It’s not a place most people can say they’ve been. But yes, it is beautiful. God, I love Orthodox architecture. Don’t you, though?? It’s so darn pretty; the photos basically take themselves! Thanks! I agree that’s its a true gem in Bulgaria – and one that most people (outside of the region, at least) have never even heard of! I am a Bulgarian girl, deeply delight from your post. It is surprising how much a foreigners appreciate the “wealth” of Bulgaria, and how insignificant are they for a typical Bulgarians. political attitude towards our country has led many young and successful people to leave the country and seek development mostly in Europe. I, myself spent some time in Washington D.C. and was fascinated. 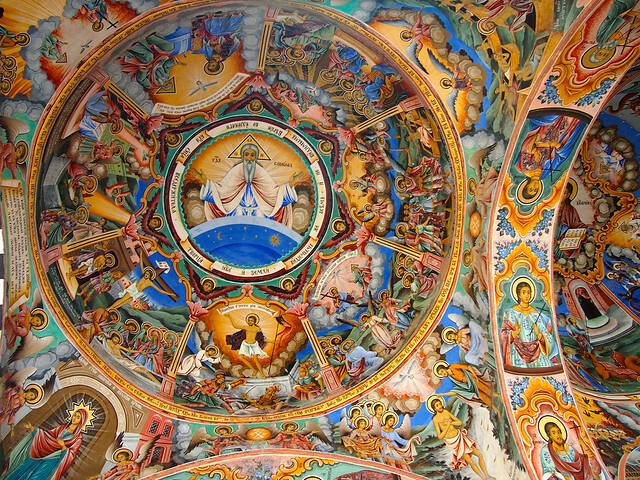 Although I visited the Rila Monastery not once I pricked while browsing your blog and photos of Rila Monastery. I wish you many more trips and explore the whole world! Thanks for writing about Bulgaria with such a warm feelings despite all bad thing in our country! Lovely photos. The murals look absolutely amazing! They are so incredible – and so colorful, too! 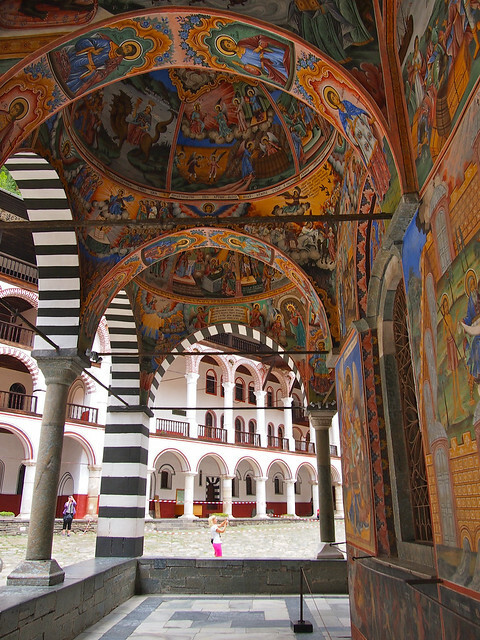 Rila monastery is unbelievably beautiful. We’re going to Europe this summer and I’m definitely adding Bulgaria to my list. I’m so in love with Byzantine architecture and history. Thanks for sharing. I’m a history teacher and I can’t wait to read the Historian.